Language and metaphor are woven richly in much even all of the material indexed here. At some point, I'll get around to adding a gathering of hardware store tweets, collected sporadically and unsystematically over recent years. A good number of them involve dreams. Fine essay, accompanied by three beautiful photographs by Neil Slavin, one of which — occupying a spread across pages 120-21 — is shown below with Mr. Slavin’s kind permission. I like this too — There were no display cases as such, and thus, my father remarks in passing, no such thing as impulse buying. That meant everybody who came to buy something knew what they wanted, and knew what to do with it once they got it. Imagine a town of people with knowledge in their hands!.. 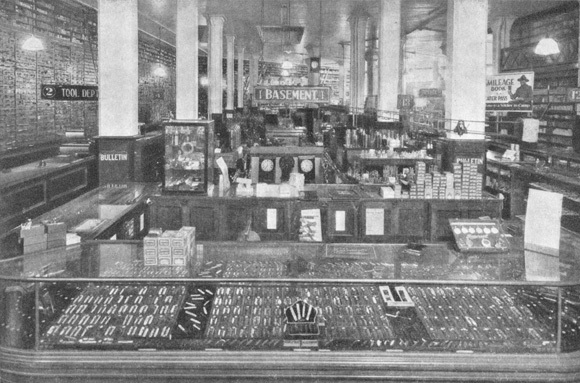 It is the supply-house character of the traditional hardware store, all goods in drawers and boxes, behind the counter, that must have been intimidating to many, men and women, who were not specialists and had no mastery of arcane hardware vocabulary. One finds this less in hardware stores now — where drawers are a thing of the past — but it’s not vanished, and can be found also in electrical and plumbing supply outlets, masonry yards, and other venues. Might have filed this essay several which ways. Language will do. 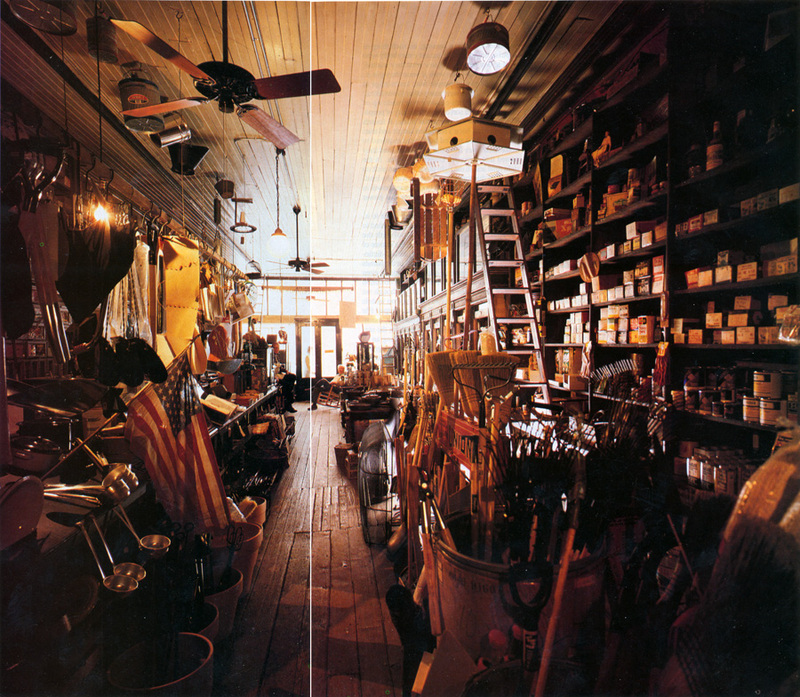 The essay is accompanied by Neal Slavin’s photographs of Harrison Brothers hardware store, established in 1879 and operating on these premises in Huntsville, Alabama, for ninety years. The images offer the natural — not artificial — semi-sepia wash that hardware stores sported, thanks to unpainted wooden shelves, old boxes and labels, rust and dust, shadow, punctuated here and there by glint of new metal, new label. Ironically, twenty years later... Harrison Brothers’ website explains that the store ...is more than a glimpse of old Huntsville. It is a shopper’s delight. On the west side of the store, a stack of antique biscuit jars brimming with old-fashioned candies tempts youngsters of all ages. Cotton throws, colorful tins, marbles by the scoop, cast iron cookware, and oak rocking chairs share space with garden gadgets, bird feeders, and whirly-gigs. We stock books, cookbooks, prints, postcards, and other items relating to Huntsville and Madison County’s history. Florence Adams, I Took A Hammer In My Hand (1973), cloth edition. Jacket design by AKM Associates. 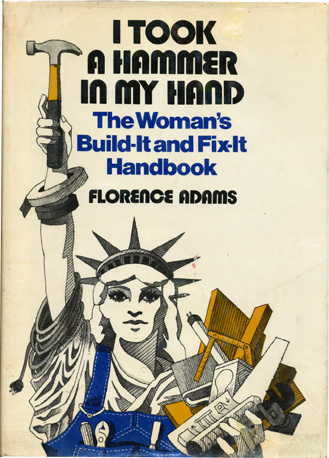 Florence Adams, The Woman’s Build-It & Fix-It Handbook (1973), paper, minus the automotive section. Florence Adams. The Woman’s Build-It & Fix-It Handbook. 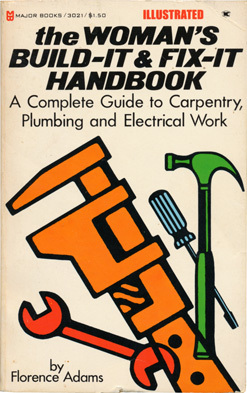 subtitled A complete guide to carpentry, plumbing and electrical work. Chatsworth (California): Major Books, 1973. This is described on copyright page as an authorized and abridged reprint of I Took A Hammer In My Hand, New York: William Morrow & Co. (1973), which included a section on automobiles (pp307-53), and some other material. Florence Adams produced a show on WBAI (the Pacifica radio station in New York) in the 1970s, called Take a Hammer in your Hand, Sister. Search the WBAI Folios listener guide via archive.org, e.g., here. a poker game in which players generally bet based on the value of their hands and do not bluff. 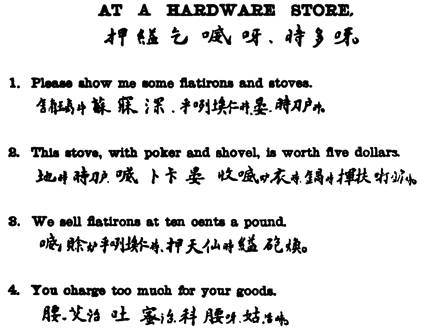 An allusion to the True Value chain of hardware stores in the US. via Tom Dalzell. The Routledge Dictionary of Modern American Slang and Unconventional English (2008). At a Hardware Store . R. A. Salaman. Dictionary of Woodworking Tools c. 1700-1970 and tools of allied trades (1975). where we find this — I knew a man went into a hardware store and asked the storekeeper whether he should buy something. Elisabeth Geier. Pedestrian "an essay"
with sub(? )title "The Nostalgia of the Neighborhood Hardware Store." A visit to hardware store, together with dog, to get new keys for an apartment, post breakup. I want to fill my arms with every kind of hammer and run down the street breaking windows and heads. I read somewhere that the end of a significant romantic relationship affects the brain the same as death; grief is grief, no matter the cause. Vivian Gornick. On the Street, in Approaching Eye Level. Boston: Beacon Press, 1996 (originally in The New Yorker)? An anecdote about taking a kitchen faucet spray attachment down to the hardware store. The usual trope of the uncertain woman, intimidated by plumbing, hardware stores. Presented here as one of several examples of street theater. The narrator presents her problem; the guy figures it out immediately, and gets the needed part. He screwed the spray back on, easy as you please. Oh, I crowed, you’ve done it! Torn between the triumph of problem solving and the satisfaction of denial, his mouth twisted up in a grim smile. Metal, he said philosophically, tapping the perfectly fitted washer in the faucet. This, he picked up the plastic again, this is a piece of crap. I’ll take two dollars and fifteen cents from you. I’d quote the passage entire, but it can be read here. My patient had braved bad times too, in his hardware store, reading the classics and listening to music when no customers were there... The big question in his life now was whether he should sell the hardware store and retire. A good story, about a fellow whose intensity gets in the way of his enjoying music at the symphony, and the notch in the tumbler whose turning returned that ability to enjoy that music, his store, his life. Hardware stores appear here and there in the psychotherapeutic literature; watch this space for more. We have used system-analysis tools successfully to aid water planning in the U.S. Army Corps of Engineers (USACE). Our success is due to adoption of hardware-store rules. The rules include: (1) understand the planning problem, (2) seek application rather than publication, (3) fit the tools to the problem, (4) address solvable problems, and (5) support continued use. The paper begins with a discussion of How a Good Hardware Store Functions. However, not only does knowledge depend on the Good; existence does too. The wrench in the previous illustration exists only because it is good for something. No one would have made it had it been good for nothing. This is more clearly understood when we see that this type of tool is not found in Tibet, where people cannot make use of it. And, to continue the illustration, the wrench ceases to exist when it is no longer good for anything. A part of it breaks; it can no longer perform its function. True, the hardware dealer may in words call it a wrench, a broken wrench. But more likely and more accurately he would say, in disgust, it was a wrench. If one reply that at any rate it still exists, the answer is: the it which still exists is a piece of steel because it is still good for whatever irregular pieces of steel are good for; the wrench, however, has perished. Heidegger seems to be lurking in this discussion. Cathy Smith. (A)RCHITECTURE AT THE HARDWARE STORE. (2007) Available via the institutional repository of the University of Technology Sydney, here. The author’s abstract — Although DIY products and systems were developed to help non-professionals, they can also enable professionals to experiment with different methods of creating buildings and spaces. DIY approaches allow people to change spaces while they occupy them, because do not require specialized construction tools, knowledge and insurance. This has practical implications for design and its practice. I show how DIY approaches create evolving, germinant spaces by looking at examples of site-specific installations and experimental residential projects. The blurring of designing, making and occupation in these projects reveals how everyday materials can act upon and transform design practice. The clerk has a teaching role — helping others define their problem, then devise its solution. More studio-based consultation than ex cathedra lecture, the presentation is improvisatory, provisional, contingent on what and who’s at hand, wherewithals and experience. It’s how I teach still. Yet the clerk in the hardware store is always an amateur, and knows it. His/her advantage over the customer — never a certainty, to begin with — is his/her own personal experience, tempered by iteration after iteration of the same problem, expressed by and solved for one customer after another. Again, sounds like studio teaching. Wallen text is From an address delivered before the New York Shoe Retailers’ Association. It examples the literary (and even oratorical), pompous (to our ears) advertising style of that time. This is a the story of one hundred years of one house in the hardware business. A record of achievement in the hardware field is, of its very nature, a chronicle of the progress of mankind. One might not look for romance in the sombre aisles of the hardware storehouse. Reflect that the flinty word hardware symbols the heroic in man. Hardware comprises the ax, the saw, the millstone and the ammunition with which our fathers braved the unknown wilds, wresting from the soil and the forest the means of life and civilization. The sturdy early American hardware merchants naturally conducted their businesses after the English fashion. It was the Romans, who developed English iron-working. In the Forest of Dean, forgest and tools, along with Roman coin, were unearthed. The ironmongers of England were regarded with great respect. They formed their guild in 1462. It was with this wealth of accumulated knowledge that the American hardware merchant commenced business in the days of colonization. American hardware stores, therefore, were never rudely primitive. Today they are the finest in the world. By 1800 the Atlantic seaport towns were well supplied with dependable but simple hardware. Seth Thomas was producing the early examples of his celebrated clocks. John Jacob Astor was buying tools and other hardware in great quantities. A few years later Jonas Chickering made his first piano. In 1818 the farthest west hardware store was established in Buffalo by George and Thaddeus Weed. In a wilderness village they courageously planted a well-stocked store. Their contribution to the cornerstone of the future metropolis on the Niagara frontier cannot be measured in words. They heartened the early settler, lightened his labors and protected his very life against the treachery of the savage. It is of such stuff as gunpowder, plowshares, two-men saws and logging chains that the refinements of life are born. Before silks and silver was stone and iron. The Weeds, then and now, bore the title of hardware men proudly, for it implies civilization-builder. Now, then, for their story. Wallen’s book is is From Ox-Cart to Aeroplane: One Hundred Years of Successful Business 1818-1918, Published by Weed & Company, Buffalo, N.Y., 1918. The copyright page states : Text and Plan by James Wallen. The 50-page volume includes several halftones of building exteriors and executives, and two interior views of the Main Street Store, Buffalo, and another of the Counting Room in the Swan Street Building, Buffalo. Norman refers to research by Brent Reeves and Gerhard Fischer, and cites Brent Reeves, Finding and Choosing the Right Object in a Large Hardware Store : An Empirical Study of Cooperative Problem Solving among Humans. (Technical report.) Department of Computer Science, University of Colorado, Boulder, 1990. I’ve not been able to access this paper. McGuckin Hardware describes itself here. A predecessor of Alpha Beta supermarkets, in Southern California, did at one time organize its offerings by alphabetical order, hence the name of the chain. See the groceteria page on Alpha-Beta, which cites Esther R. Cramer, The Alpha Beta Story (Alpha Beta Acme Markets, 1973). abstract — Research shows that store image is an important component of a consumer’s store choice and use of a store environment. The impact of age on consumers’ perceptions of a retail store image is examined. Some of the material presented on this very web page might serve as evidence for an update or expansion of this fascinating and nuanced paper. Sadly, Dr. Joyce died in 2007. See sad news. Operating Expenses in Retail Hardware Stores. Bulletin No. 12, Bureau of Business Research, Harvard University (April 1919). See here. This brief study hints that large inventories — of angle iron, lead wool, lug nuts, &c., that encourage emotional and even nostalgic associations with hardware stores — slowly undermine the business. They mean slow turnover and high interest and other carrying expenses. The imagined hardware store owner is content to sit atop the stock and swap stories with customers. But his business can’t last. The vast philosophical literature on tools, equipment and technology generally is beyond the scope of this survey, which would have to include Heidegger. See Peter-Paul Verbeek, his What Things Do: Philosophical Reflections on Technology, Agency, and Design (Penn State Press, 2005). Fabio Morabito, Toolbox (1999) contains philosophical essays on topics like the file, sandpaper, screws, and the hammer. It is written somewhat in the style of Vilem Flusser’s The Shape of Things: A Philosophy of Design (1993/99).